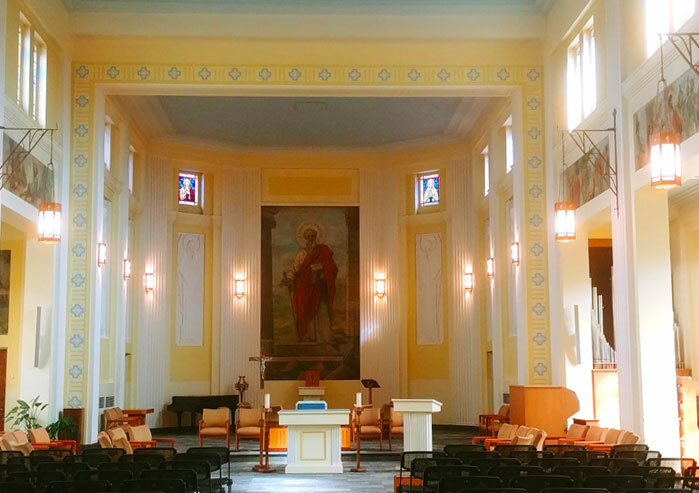 De Mazenod Chapel is located in Laframboise Hall and is named after Eugène de Mazenod, bishop of Marseille and founder of the Oblates of Mary Immaculate. It serves as the venue for all major liturgical celebrations on the University calendar, such as the opening and closing masses, as well as the celebration of Advent and the beginning of Lent. The chapel is the largest in the University and is home to several Christian groups within the University community. Thus, the chapel hosts a wide variety of activities throughout the year. Roman Catholic Mass is celebrated on Monday, Tuesday, Wednesday and Friday at 12:10 p.m. in De Mazenod Chapel. The liturgical activities of the Anglican Studies Program take place in De Mazenod Chapel. The Anglican community celebrates Eucharist in the chapel on Thursdays at 12:10 p.m., as well as at 8:10 a.m. on particular Holy Days such as The Epiphany of the Lord, The Holy Innocents, The Conversion of Saint Paul, The Presentation of the Lord, Ash Wednesday, and The Annunciation of the Lord, to name but a few. In addition, morning prayer is celebrated in De Mazenod Chapel with various members of the Anglican community alternating as presider. For scheduling or more information, please consult the Anglican Studies web page on the Saint Paul University website. Other liturgical activities include evening prayer, which is held in De Mazenod Chapel every Tuesday at 4:30 p.m. Evening prayer forms a central part of the University’s commitment to inter-Christian collaboration, set in the context of worshipping the Triune God. Eastern Catholics, Roman Catholics and Anglicans take turns leading Vespers each week.